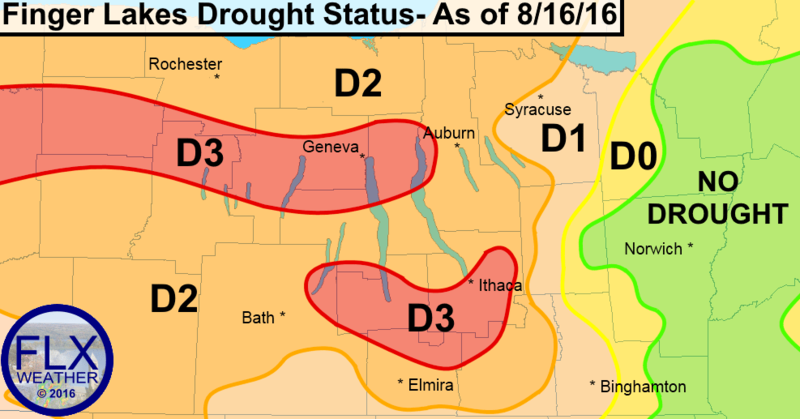 Parts of the Finger Lakes are now classified as a Level 3, Extreme drought. Parts of the Finger Lakes have seen the drought worsen in the last week (yellow), while other parts have seen some improvement (green). Click to enlarge. For the first time since the Drought Monitor began in 2000, Level 3 (Extreme) Drought has shown up in the Finger Lakes. This is the 2nd worst possible classification of drought. Two areas, accounting for a little over 6% of New York State, have been placed into Level 3 Drought. The northern Finger Lakes, including Geneva and Canadaigua, are included in an area that stretches east to west back towards Buffalo. 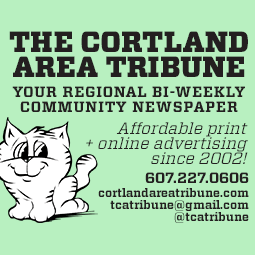 The second area includes Hammondsport, Watkins Glen and Ithaca. The majority of the remainder of the Finger Lakes remains in a Level 2 (Severe) drought. Some improvement was seen along the eastern and southern fringes of the area, where Level 1 (Moderate) Drought has made its way back. Further east, the area of no drought has expanded, and now encompasses over 12.5% of the state. This is an increase from about 8% last week. The cut off between Level 3 Drought and No Drought is incredibly tight. 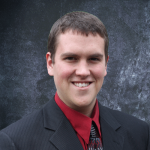 Dryden, situated in east-central Tompkins County, is in the Level 3 classification. 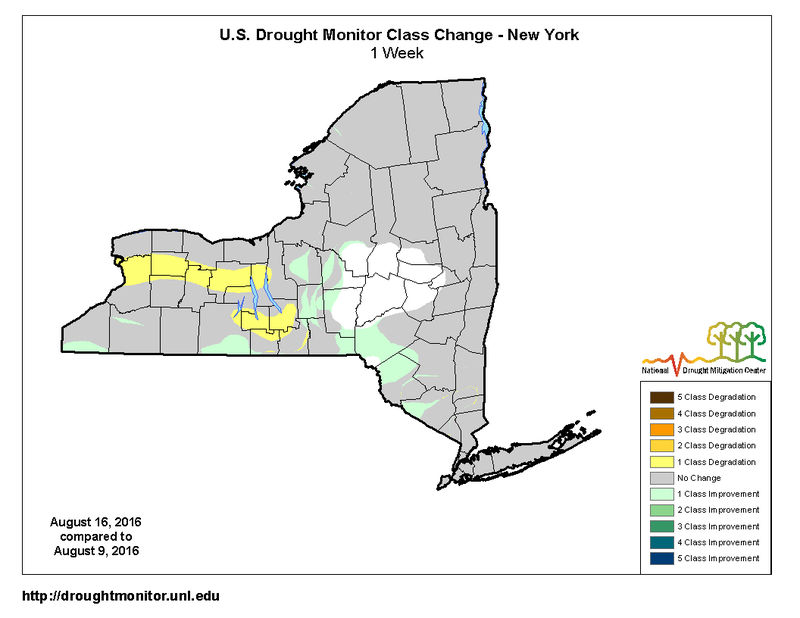 In eastern Cortland County, 20 miles to the east, is in the no drought classification. Rainfall during the 7 days ending Tuesday morning was beneficial across the Finger Lakes region, but not enough to make a significant impact in the drought for most areas. The week considered in the current drought report, August 9-15, was a fairly good week for the Finger Lakes. Heavy rain moved through parts of the area on Wednesday, August 10th during the morning hours. Widespread showers and thunderstorms also developed on Saturday, August 13th. Additional rain fell on Tuesday, August 16th, but is not included in the two rainfall graphics presented here. The heaviest rains were concentrated over the eastern Finger Lakes and the Southern Tier, where the thunderstorms were most numerous Wednesday and Saturday. Areas in yellow in the above graphic received over 2 inches of rain. 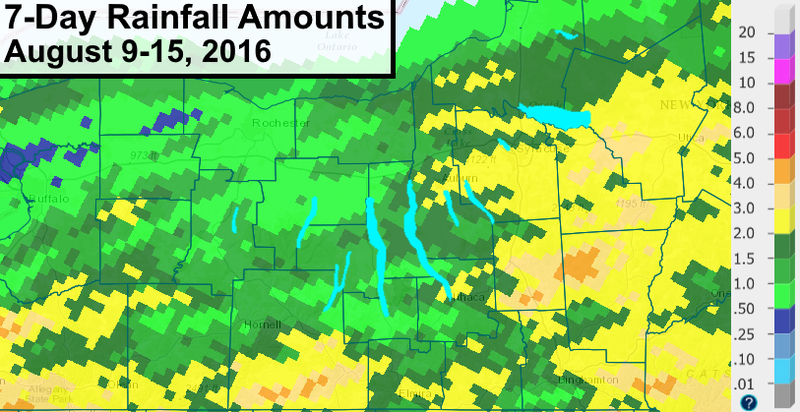 The entire Finger Lakes region got at least a half inch of rain. Rainfall amounts were near or only slightly above normal during this past week in the Finger Lakes. Click to enlarge. While good news, the actual net gain against our average rainfall was minimal for most areas. Shown to the right is how much rain fell versus how much should normally be expected during the 7 day period. Unfortunately, the areas that saw an inch or more (dark greens and blues) above normal was very small. The vast majority of the area was right around average (grey). 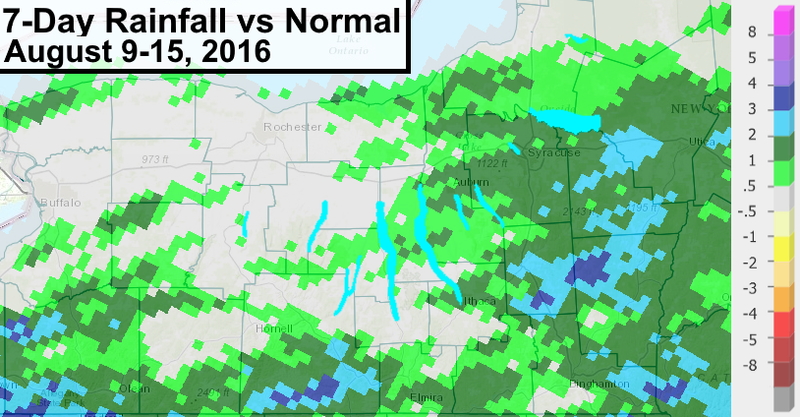 While no where was significantly below average, the rain that did fall mostly kept conditions at the status quo. Much of the rain also came in downpours. Instead of soaking into the ground, as in a slow, steady rain, much of what fell quickly turned into runoff and had little beneficial impact. During the coming week, there is one primary chance for significant rain in the Finger Lakes. A strong cold front will move through the area on Sunday. Widespread showers and thunderstorms are expected with this system. Most areas should see between a half and one inch of new rain. Some of the heavier thunderstorms, however, could dump upwards of 2 inches of rain. Again though, much of this will turn into run off and not soak into the hard, dry ground. High pressure will build in behind this system, keeping most of next week dry. The good news is that it will be cooler than normal next week. The sun is also sinking lower in the sky as summer wanes. The drought really ramped up in June, when the sun was at its peak strength and skies were continuously clear. While the lack of precipitation will not help the area, as long as we keep getting some bouts of rain, the drought will probably not become more intense. Is there an explanation for why the Finger Lakes region is much more affected by this drought than regions East of Binghamton? There have been a number of days here storms and rain was heavy and widespread, but didnt develop until it get east of I-81. They would see 1-3″, the Finger Lakes would get nothing. So why did these storms not develop more westerly this summer? The deficit is so extreme that it doesn’t seem to be a matter of bad luck. Looking at the entire northeast, most of the region is in a drought of some sort. The areas to our east are one of the only exceptions. Had they not gotten those handful of events, they would be like us…and somewhere else would be out of the drought…or the events could have spread out and the whole area would be in a drought, but of less severity. The weather is similar to a series of waves in the atmosphere that come and go. Depending on when they come through, they may have more or less energy to work with. Sometimes the waves come fast, sometimes slow. There really isn’t any hidden reason for us being dry and areas to the wast not be. Its a freak product of the chaos of nature, and it will disappear in time. Not sure if that makes much sense…it is a hard thing to articulate. It isn’t just luck…but then again, it really kind of is. Thank you for your reports, Fred, Nick & Marty! I have little doubt that there are likely areas that do not fall neatly into the zones from the Drought Monitor. Lines have to be drawn somewhere, but the weather could care less about where we draw them. The Drought Monitor website says they use 5 primary indicators and a number of other, supplemental indicators and trained observer reports to produce their maps. They do not go into detail on what those are, but there is likely more to the story than what we can easily observe. In the end though, it is key to remember that being very near the D3 zone is practically the same as being in it. The Drought Monitor breaks drought conditions into 5 distinct levels, but in reality, its a continuous range of severity that doesn’t have boundaries. Fred is spot on. I live on the county line of northern Tompkins and southern Cayuga , right across the lake from Interlaken, and have not gotten more than 4 tenths of rain per rain event since early June. 1 to two tenths per occurrence has been normal for my location. The rain has been strange this year. A friend who lives on Sherwood road just above aurora has been like me… 1 tenth, 2 tenths, where just up the road , 1 mile east, his neighbor will get 1 inch to 1 and 1half inch of rain. It has been extremely spotty with amounts varying tremendously. I drove through Lodi, Ovid, lodi, Interlakenhoheweg, back to Ovid, to Lodi, Interlaken, Romulus, Ovid, Interlaken and saw brown grass. having driven thru Binghampton to Ithaca to Interlaken twice in the last 2 weeks, as recently as last Sunday, I would observe, based on the amount of green in grass, trees, etc … that Ithaca and south is much better off than the Interlaken area. So I would not agree that Ithaca area is ‘more drought’ than areas north of Ithaca, on west side of Cayuga Lake.